Chinese President Xi Jinping arrived here today on his first visit to Pakistan where he is expected to sign a deal for an economic corridor worth USD 46 billion and other agreements to bolster their all-weather strategic ties. Islamabad, Apr 20: Chinese President Xi Jinping arrived here today on his first visit to Pakistan where he is expected to sign a deal for an economic corridor worth USD 46 billion and other agreements to bolster their all-weather strategic ties. The Chinese president and his wife Peng Liyuan were accorded a red-carpet welcome when they landed at the Noor Khan airbase in Rawalpindi. They were received by Pakistani President Mamnoon Hussain, Prime Minister Nawaz Sharif, army chief Gen Raheel Sharif and members of the cabinet. 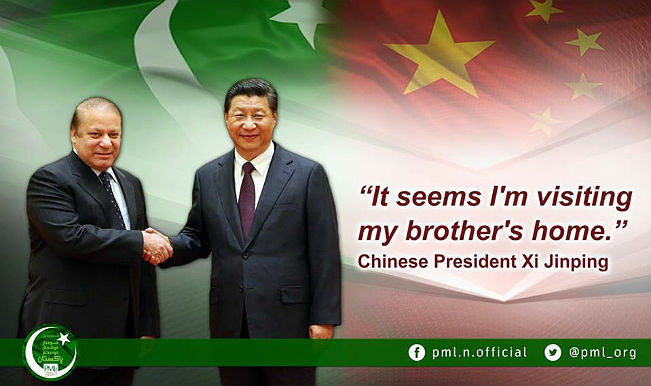 Xi’s aircraft was escorted by JF-17 Thunder jets which Pakistan built with the help of China. Tight security measures have been enforced in the capital while security personnel have been deployed on all vital city roads during Xi’s visit. At the airbase, a 21-gun salute and guard of honour was presented to the Chinese president. A cultural show also entertained Xi and his wife on their arrival. Banners reading “Pakistan-China Friendship Zindabad”, portraits of the Chinese and Pakistani presidents and flags of the two countries waved across Constitution Avenue welcoming Xi to Islamabad. After talks, the two countries are set to sign the agreement for the China-Pakistan Economic Corridor (CPEC) that will link China’s underdeveloped far-western region to Pakistan’s Gwadar deep-sea port on the Arabian Sea via PoK through a massive and complex network of roads, railways, business zones, energy schemes and pipelines. Pakistani Development Minister Ahsan Iqbal said that the the total cost of the CPEC is USD 46 billion. “It is not a single project but includes several projects related to energy generation, infrastructure development and business areas,” he said. The initial focus is on electricity and some of the early harvest projects would be ready in three years and provide about 10,400 MWs of electricity. Xi will meet Hussain who will host a lunch in his honour and will also confer Pakistan’s highest civilian award – ‘Nishan-e-Pakistan’ – on the Chinese president. Prime Minister Sharif will have detailed talks with Xi who is also the General-Secretary of the ruling Communist Party of China, and later several agreements will be signed. Ahsan said that projects with worth up to USD 28 billion were ready and the groundbreaking of some of these agreements will also be performed. China has decided to go ahead with the ambitious CPEC despite serious security concern in its restive Muslim- dominated Xinjiang as well as the Taliban threat in Pakistan. The corridor, regarded as the biggest connectivity project between the two countries after the Karakoram highway built in 1979, is a centrepiece of China’s ambitions to shorten the route for its energy imports from the Middle East. China has played down India’s concerns on the 3,000-km corridor that passes through Pakistan-occupied Kashmir (PoK), saying that it is a commercial project. Xi said yesterday that his first trip to Pakistan is like visiting the home of his “own brother” as he vowed to firm up China’s strategic ties with its all-weather friend. A defence agreement worth USD 4-5 billion to provide eight latest submarines is also expected to be signed, more than doubling Pakistan’s fleet.